Where are you at with your new years’ resolutions friends? If being healthier was on your list, I hope you are on track! While minor hiccups are a part of any undertaking, if you take each day and each meal as an opportunity, you will do just fine! I am a firm believer that breakfast is the most important meal of the day. Not only does breakfast get your digestive system reignited, it sets you up in a great frame of mind. If I start my day with a filling, wholesome breakfast it helps me make better choices throughout the day – from going to the gym to picking a salad for lunch! For years, my breakfast consisted of a large Starbucks coffee and sugary muffins. After that “breakfast” I wouldn’t get hungry till late afternoon, at which time I would crave more simple carbs and empty calories – foot long sub sandwich anyone? When I was running late in the morning trying to beat the traffic to get to work on time, that cup of coffee and a muffin to-go seemed like my only option. Being able to eat a healthy breakfast required a little bit of advanced planning, but once I got in the habit of it, it became as easy as going to Starbucks. Keeping healthy foods readily available was the secret! Whole grains are full of fibers, which help with digestion, while the good carbohydrates in grains give you energy for hours. 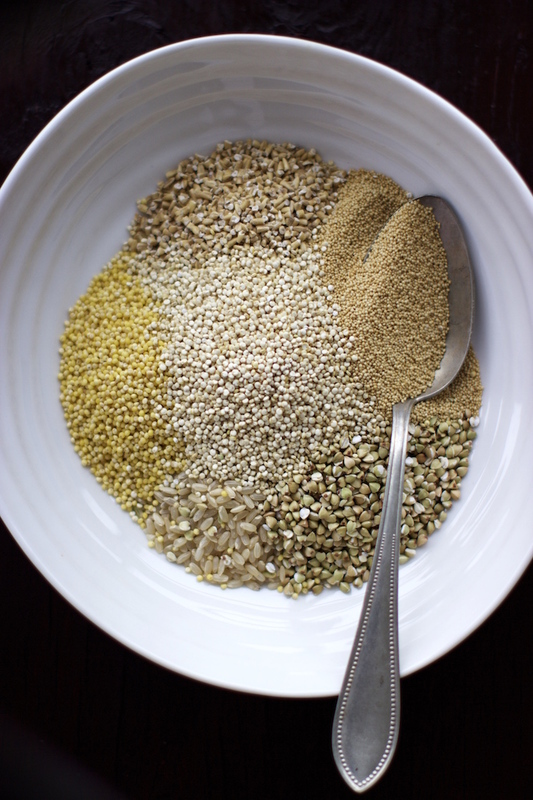 In this gluten free whole grain porridge, I have used amaranth, brown rice, buckwheat, millet, oats and quinoa – all the whole grains that are good for you. I am always looking for opportunities to include these grains in my diet. 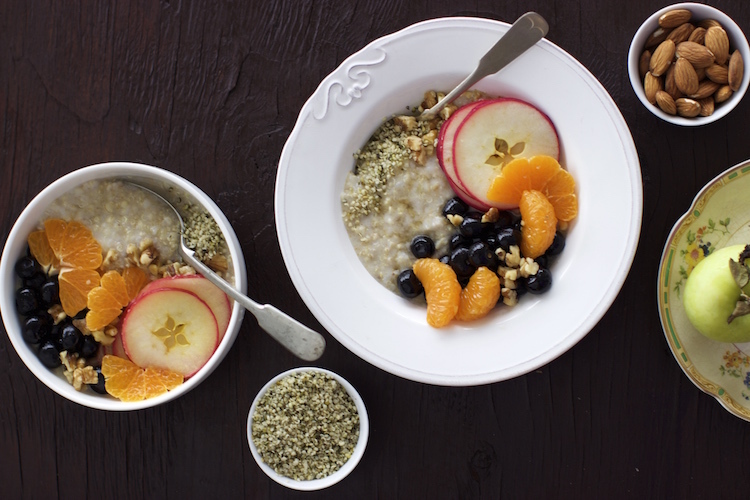 You can use your favorite super food toppings with this porridge – I have used Goji berries, chia seeds and protein rich hemp seeds with nuts and fresh fruits. The best thing about this breakfast is you can pre-cook and store for up to 5-7 days, so no more excuses for skipping breakfast! Bring 5 cups of water to a boil in a saucepan. Add the grain mixture. Reduce heat to medium-low and simmer for 40-45 minutes, stir occasionally. Cook till water is absorbed and mixture has creamy consistency. 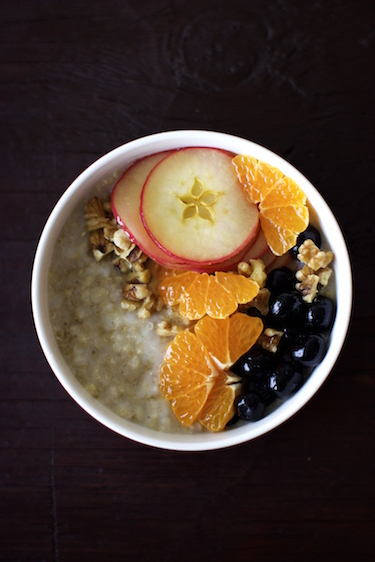 Take warm porridge in serving bowl, top with your choice of toppings. 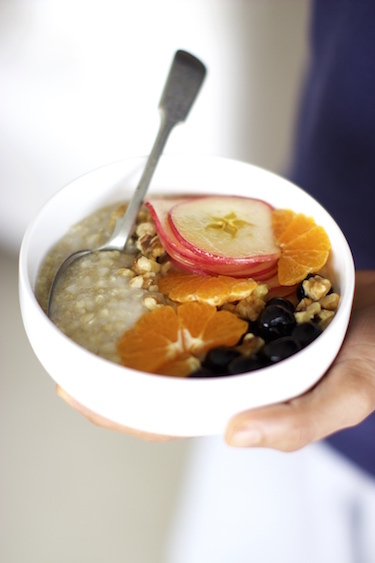 If storing for later use, let the porridge cool completely before storing. Store in an air tight container. To reheat, add a splash of nut milk or dairy milk and heat in a pot. 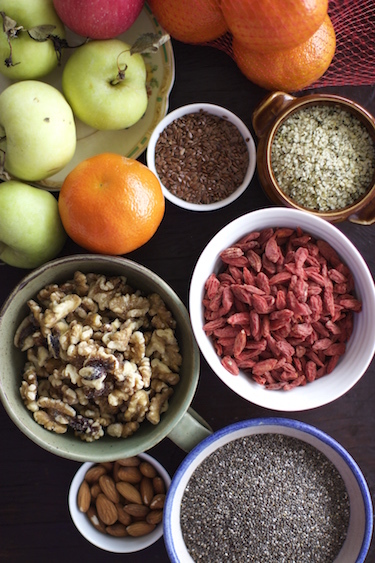 Mix well and serve with your favorite toppings. This is just lovely. I love the toppings. And I feel like I could run a marathon after eating this! 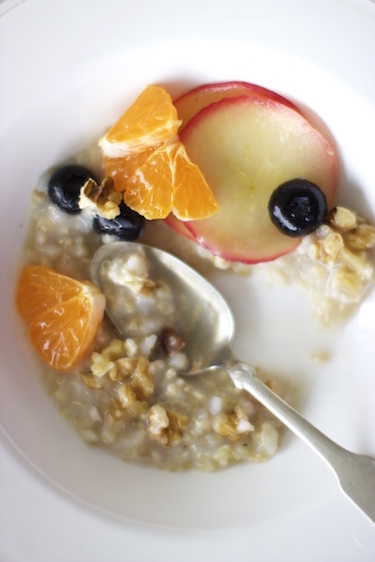 I love how you combined all those healthy grains into one dish! I bet the texture and flavors are amazing!!! I’m with you girl. Breakfast is where it’s at! Gotta start the day off right, isn’t it? This looks really delicious and I love all the different coloured fruits you’ve added. Wonderful Post,The information is very interesting,Thanks for great recipe,Good For Health. Very Delicious Blog,Pics are showing amazing,keep sharing us.